Click 2 Crop is an easy to use photo editor designed keeping one thing in mind – Speed. 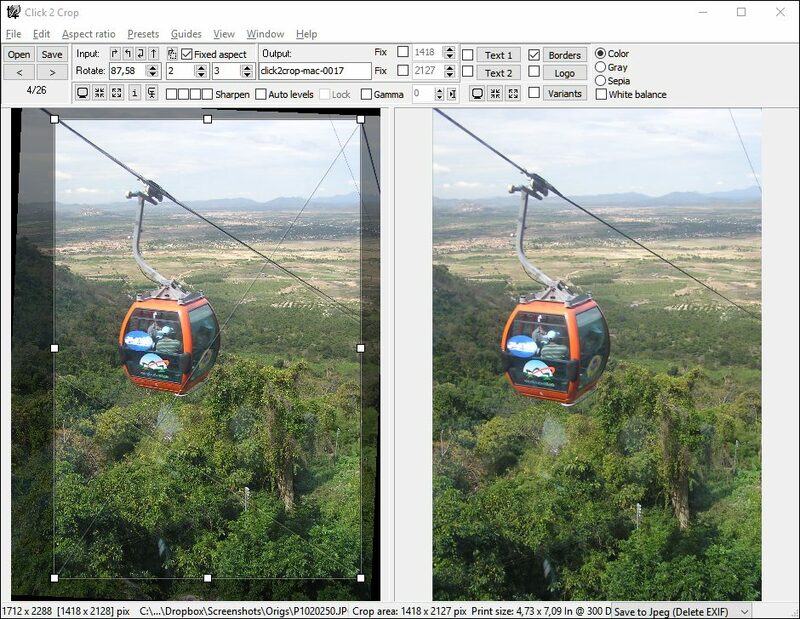 Click 2 Crop enables you to crop, resize and optimize your photos very fast, within a few mouse clicks. It has a simple but very effective crop tool that lets you preview the result while you’re editing the image. 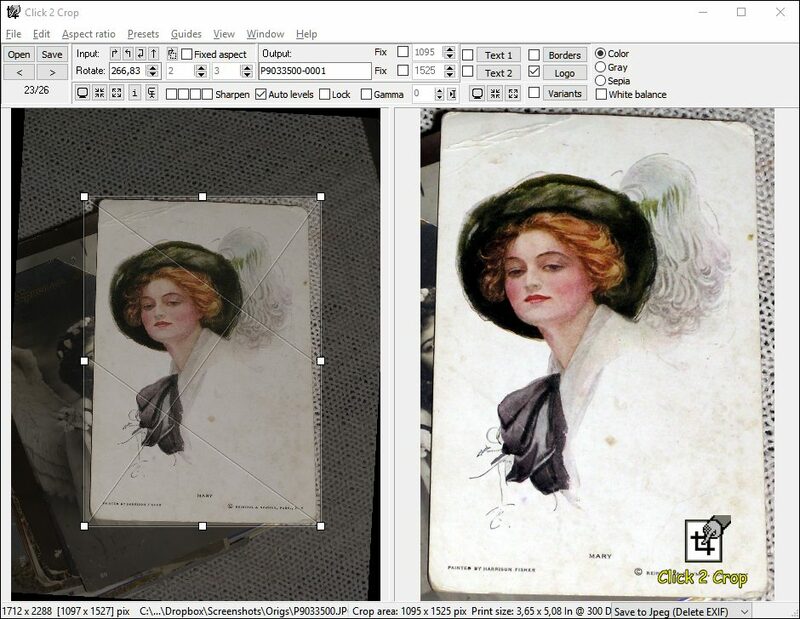 You can crop the image to remove unwanted areas of the frame or to create a zoomed-in effect, and can view the output on the fly while you’re doing these edits. Besides that, Click 2 Crop offers some popular image enhancement options like white balance correction, auto level correction, gamma adjustment, color correction, rotation, sharpening and so on, and provides on the fly preview without any need to save the image. You can also add frames to your images (using masks), add Text, view EXIF data, e-mail cropped images directly without prior saving, import from a TWAIN source (camera, scanner) and can do a lot more, very easily and in very less time when compared to other photo editing programs. — MS access database is not very good at handling large files, the computer gets very slow when large photos are attached in a database. And it gets worse, printer spooling takes forever. The Click 2 Crop solved this. I have reduced the photos in consistent small sizes, hence the database run significantly faster. — Click 2 Crop also solved the problem of stretched photos. Using the software, I am able to crop photos with precision. My clients are very satisfied. — I used Photoshop before. 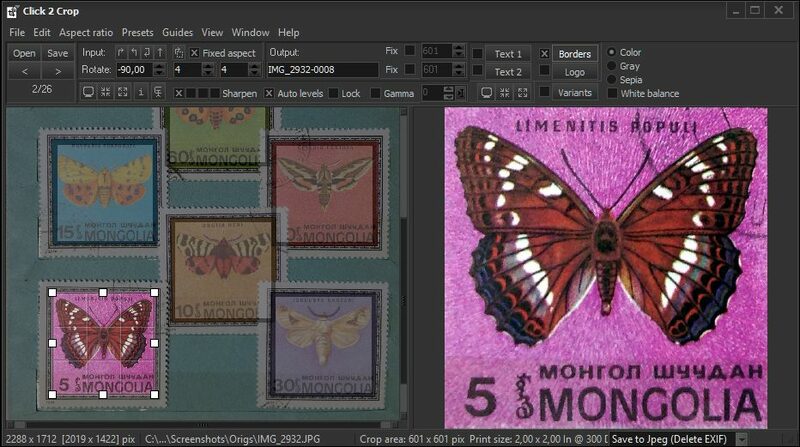 The software is good, but when you will edit photos for IDs, its nothing like the Click 2 Crop. Its so simple to use. If you are a Blogger/Web Designer/CMS application user or you just want to create images for your first Internet page to show your lovely Fritz, the cat, to anyone who hasn’t seen it yet - you will be able to prepare nice, clear, sharp and fast loading photos for your web pages. 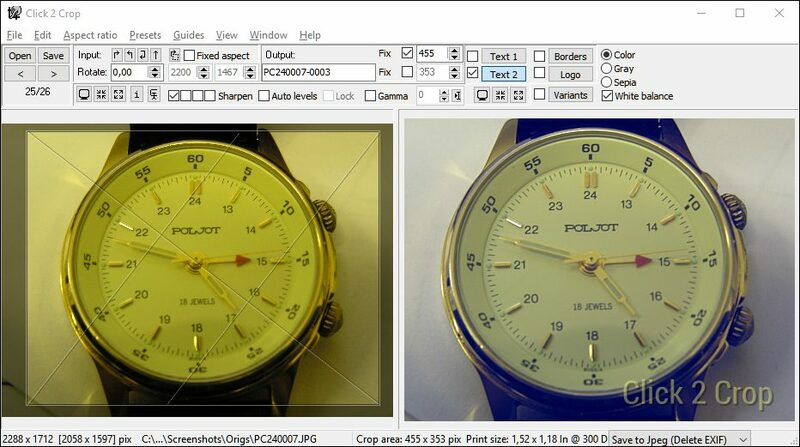 No more resized images that look ugly, takes ages to load, or with reduced quality. With just a few mouse clicks, you will get professional looking images for your site. If you are a home user who scans your printed photos and looking for a program to crop them, edit and save them in a very easy way and quickly, without spending a fortune on photo editing monsters, Click 2 Crop is the tool for you. Scan, Crop, Edit, Adjust, Enhance and Save your images quickly, and without any need to go through tons of user manuals and learning about editing processes. You have only one photo and want to devote your whole life for editing this photo. Fine then, you need full feature loaded professional image editing monster like Adobe’s PhotoShop or Corel’s Photo Paint. In an indefinite future, you might be able to make a perfect photo. The solutions above are ideal; they are for the abstract perfect world. But in the real world scenario, you have a number (from a few to maybe few hundreds) of photos and want to spend some time (few minutes or even few hours) to get the best possible results. And you really care how each and every photo will look like. This is the scenario Click 2 Crop was made for. Click 2 Crop's user interface lets you concentrate on achieving the look you want in an image without having to browse through a maze of pop-up windows and mysterious options. Click 2 Crop saves you from annoying dialogue boxes that are repeated frequently, and from the time taking editing tasks. With Click 2 Crop you'll be able to process your images carefully and manually, but with the speed of a batch processing utility. Click 2 Crop and Image Mosaic Mazaika software.